The warehouse located at Aloe siding is operated by Southside Aloe works. I built the building in 1992, and it has lived outside for 12 years now. As with real buildings, the roof is the first to go due to weather. This was my first attempt modeling asphalt three tab singles. I found a laser cutter who produced a pile of shingles using thick paper for the material. I hoped that painting the finished roof would be enough protection. This turned out to be optimisitc thinking. One of the problems with modeling outside is the final results may not come back for years. These shingles held up for about 8 years, but I had to replace some of them to prepare for the 2000 National Convention we hosted in San Diego. Four years later, the roof had deteriorated even further. I have recently made a second attempt to produce Three Tab Shingles. This time I found a gasket material that can be successfully laser cut, and had a bunch of sheets made up by John Clark, of Fall River Productions. I re-roofed this building using these new shingles. The first step was to remove all the old shingles, and sand the roof flat. Start by cutting each row of shingles apart from the sheet. There are four short attachment areas that need to be cut. I used an X-acto knife, but any sharp blade will do. Next, check to see that all the notches are free of the cut material. Some will have the little pieces still attached. Remove them before gluing the strips to the roof. These shingles are laid just like real shingles. The shingle sheet has a 1/4" strip at the bottom edge, which is used as the starter course at the bottom of each roof surface. The shingles are laid starting from the bottom, with the notches pointing down. Each row of shingles is offset 1/3 of a tab width, so that the notches only line up on every third row. This next photo shows the first few rows installed. I used a new glue, TiteBond 3, which is a good wood glue, and is formulated to be waterproof. I haven't used it before, but I trust the TiteBond brand, and decided to give it a try in this application. I found that the following technique worked very well. Spread a thin layer of glue, about 1/4" wide, along the entire roof length, just above the previously installed row. Carefully place the next row in the glue, lightly pressing each tab into the glue. This material can curl, so the lower edges have to be securely glued. Look at the back side of the row, to make sure that every tab is covered. Notice that there is still plenty of glue on the roof to secure the upper edge of the row. Position the row in it's correct location. This row is set flush with the left edge of the roof. You can see the previous rows are offset 1/3 tab width at each level. If all the notches were lined up, the water would channel as it runs off, and wear out the roof more quickly. The lower edge of the tabs should just touch the top of the notches in the previous rows. Securely press the new row in place along it's entire length. Make sure it is secure to the previous row, and the original roof surface. Some glue will squeeze out. Wipe off the excess with a damp sponge, using long strokes parallel to the rows. Wood glue can be cleaned up very easily at this stage, and leaves a better final product. I found that I got better at glue application as the job progressed, and less material squeezed out. Use a sharp stick to do a final clean right up against the lower edge of the tabs. I worked from left to right, and let the right hand edge rows just run long, and trim them at the end. This side is done, and I have begun to trim the lower left hand edge using a new Xacto blade. Both edges are now trimmed and I am ready to start the other side. Notice that the top row covers more of the previous row than normal. This allowed the top edge to be aligned with the exact peak of the roof. It will make it easier to install the ridge cap pieces. The plumbing vent and the smoke jack are installed as the shingles are laid, following standard construction procedures. The second side has been finished and the roof ridge cap has been installed. These are small pieces, one tab wide, are cut from the trimmings of the roof shingles. I bent each cap piece before installation, but the material was too thick to stay securely glued. I had to remove the pieces, glue them together as a long chain, and then bend the entire chain across a piece of stiff sheet metal. I then glued the entire chain in place, and clamped it down using lead weights resting on a couple of wooden sticks, placed right at the roof ridge. The next morning everything was tight and secure. I wanted the roof to be green to match the basic building. After maskinig the rest of the building, I sprayed with Rust-Oleum Painter's Choice chalkboard green, which is a matte finish. Make sure you take your time, hold the spray perpedicular to the roof, and fill all the little notches. I have seen asphalt shingles in black, brown, white, red, and green. 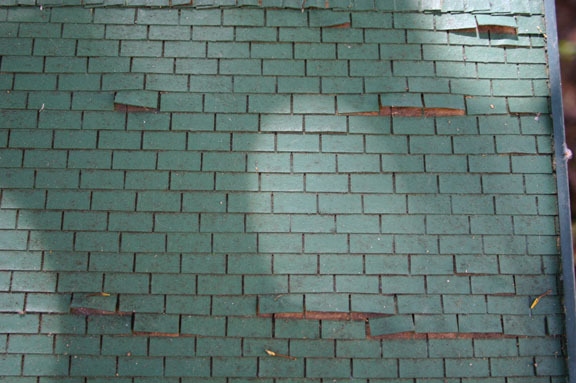 The edges of roofing material are the most vulnerable to weather, so flashing is used to cover them. I use 1/8" x 1/8" brass angle for this purpose. These pieces were removed from the previous roof. I cleaned out the old caulking (black silicone), sanded the insides for a good bond, and secured them with Plumber's GOOP. Here is the building with the completed new roof. It looks a lot better than when I started!! 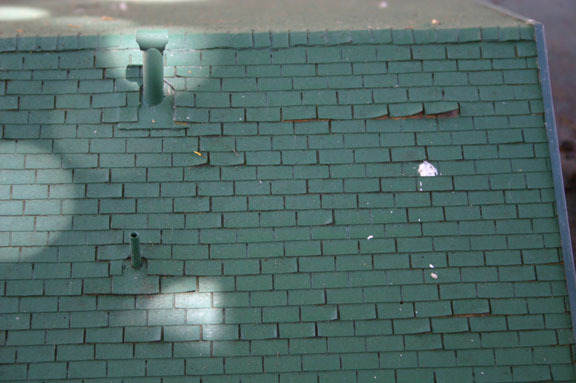 Here is are two detail shots showing how these shingles hold up over time. This building lives under a tree, which shades it almost completely. We have had 20" of rain this winter, which is three times normal for San Diego. You can see that some of the tabs have lifted and cupped. It is very important to make sure that every tab is completely glued down to the layer below. I sprayed the roof green after it was completed, so the brown natural color of the material shows where the shingles have lifted. Next time, I would spray the entire sheets before cutting the rows apart and gluing them down. That way even if the shingles moved a little, the brown wouldn't show. I am pleased with how this material holds up. It's only been 6 months, but the roof is much better protected than the paper shingles I was using before, which depended totally on the paint to protect the material. This gasket material should last for many years, even if it's already starting to look like a used roof.